Do you like New York City? Do you like cycling, running or walking? Do you like ziplines or climbing walls? Do you like yoga or fitness? If your answer is yes to any of these questions, register to volunteer at Summer Streets to help make the streets come alive with exciting programming and activities! 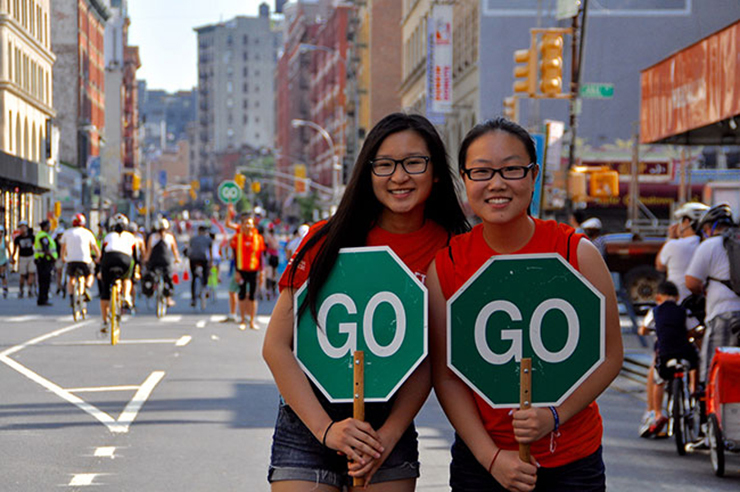 NYCDOT is looking for a group of eager and enthusiastic volunteers to assist us with presenting Summer Streets. Volunteers will assist with crowd control, handing out free giveaways and much more! Come join us to experience the “open road” free of vehicular traffic and full of jovial New Yorkers! You can work a morning shift or an afternoon shift so that you can also participate in the event yourself. If you are looking for more volunteer hours, you can also work both shifts. And don’t worry, we will make it worth your while to get up early and volunteer! All volunteers will receive a commemorative shirt and Goody Bag packed with great gifts and snacks from our sponsors. Sign up today to become a volunteer at Summer Streets 2018 and help make magic on the streets of NYC. CLICK HERE to register today! We hope to enjoy the streets with you this summer! **Please Note** Volunteers must be at least 16 years of age and must be able to work outside in variable weather conditions.